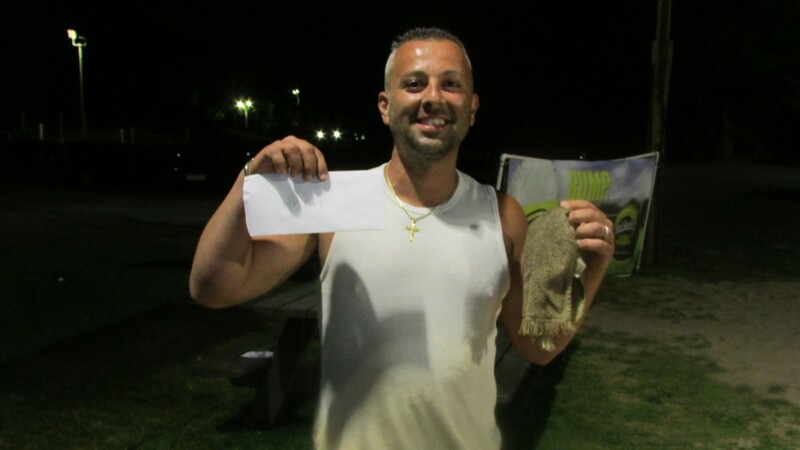 Turbo Bocce has always been about creativity and innovation. We are better than any other sports league because no matter how good things seem we never stop looking for the next great step forward. Judging by how much fun we had over the weekend, Turbo Bocce just took its next great step forward. Blind draw tournaments are the future, expect more of them, and expect more tournaments in the sand too. 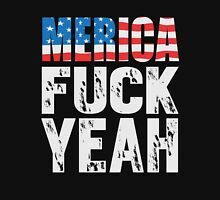 When Sharkey’s mentioned to me that 4th of July weekend was going to be a slow one, and offered to put up some prizes and a $30 all-you-can-drink special if we set up a bocce tournament, I thought it sounded like a pretty good idea. Luckily so did a decent sized group of people from the league. 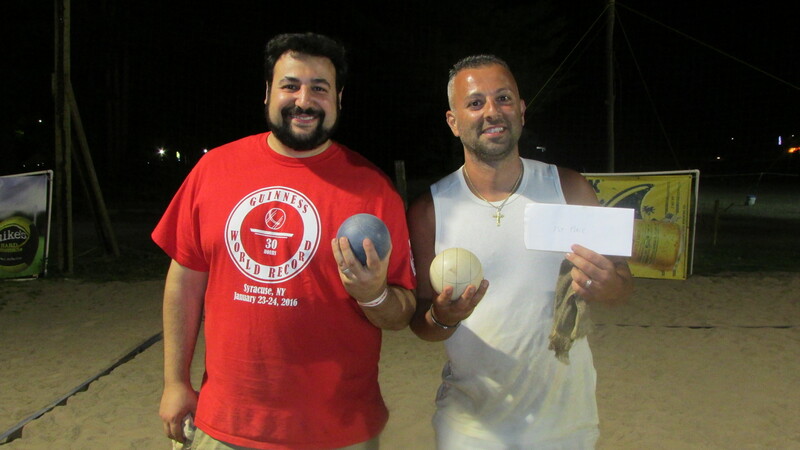 So, on Saturday July 2nd, a bunch of us got our holiday weekend started the right way with an all day, all you can drink, blind draw bocce tournament in the sand. A blind draw bocce tournament is an idea that’s been swimming around in my head for a while now. Here’s how it works; your teammate and your opponent are randomly selected for round 1. After all the games are done everybody comes back and new teammates and opponents are again randomly selected for round 2, and so on. Every round you play a new game with a new teammate. Its double elimination, so you play until you lose twice, then you are removed from the pot of people being randomly selected (although you may play again just to even out the numbers so there are no byes). Its a great way to meet new people, and to learn how to play different styles of bocce, not to mention, the winner can say she really accomplished something impressive. In this case, since Sharkey’s was providing unlimited Landshark, Shocktop, Bud Light, and Jungle Juice (a mix of vodka and fruit juice), we decided we should have a little drinking game running concurrently with the bocce. 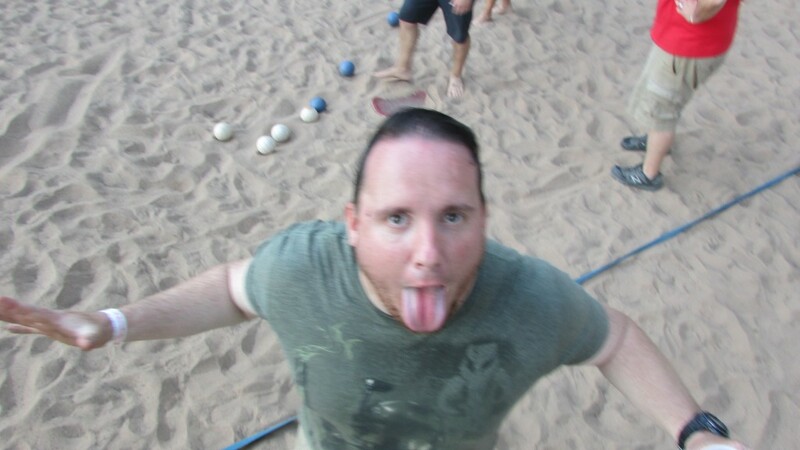 Simple rules like: you have to drink if you throw a debocce and the opposing team has to drink if you throw an ace. That’s the closest we came to keeping stats. 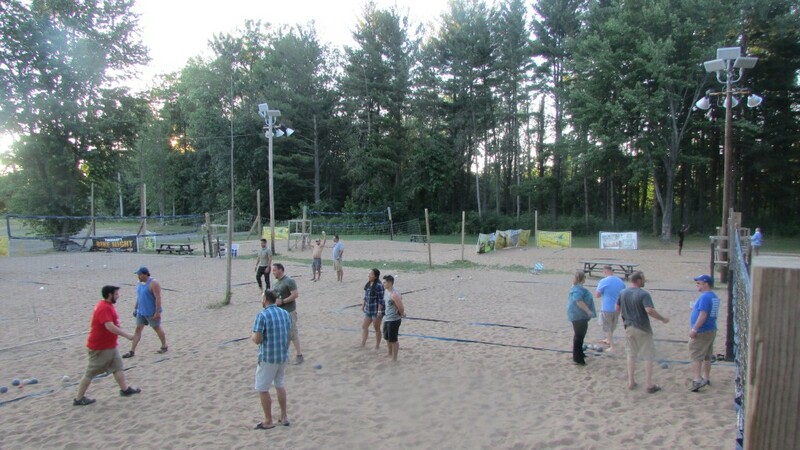 We voted to keep the tournament within the confines of the volleyball courts so it would be a true sand bocce tournament. But as soon as the teams were selected people started getting creative, like this shot over the nets. Or this shot under the nets. Or this shot off the top of the table. Even over and around obstacles the shots were pretty good, but as you see in the video below, when there were no obstacles the shots were great! Pretty much an ace a round. Its kind of a fun change from playing in grass to know that your shot is going to land pretty close to where you throw it. Some stand out performers that I can remember were, Melissa Miller, Josh Griffo, Kelly Edmundston, and Mark Streiff. The best shot of the tournament had to be made by Meg Dyer who scored 10 points on one shot. Jim Whipple (who was winning 7-1) told Meg that he’d give her 10 points if she could knock out his ace by throwing her ball through the volleyball netting. She did, making the score 11-7. Pretty impressive win. After the first round, everybody was having so much fun that we voted unanimously to change the tournament from a double elimination tournament to a triple elimination tournament. Nobody wanted the night to end and it practically didn’t. Ten hours later (around midnight) the tournament was whittled down to a final four. Andy Ingalls, Oscar Ocampo, Greg Griffo, and Paul Colabufo. Andy, Oscar and Paul each had 2 losses, and Greg had 1. The teams were randomly selected so that Andy and Oscar played against Paul and Greg. As you can see in the video below the competition was fierce, and all four players played great. Points were hard to come by. Eventually Paul and Greg beat Andy and Oscar 11-9. This eliminated Andy and Oscar and set up a one-on-one final between Paul and Greg, with Paul needing to win twice to become champion and Greg needing to win only once. I learned a lot about sand bocce in that final, so I’ll pass along a few tips . . . you know, for the next time we do this. One, its easier to throw your ball really close to the pallino on sand. 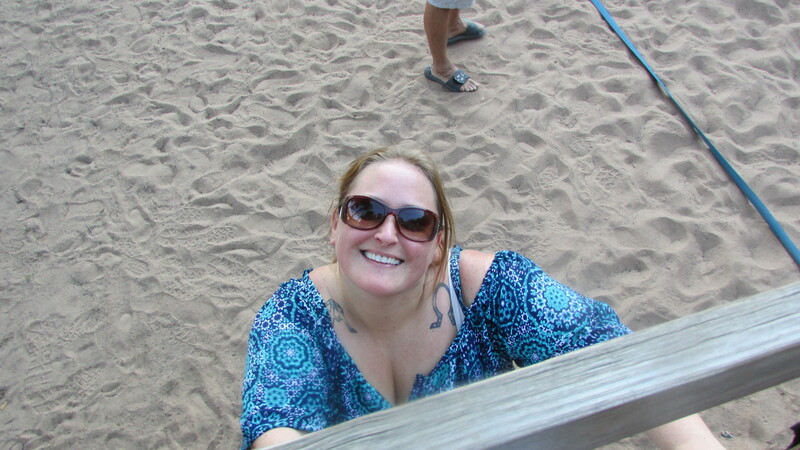 Two, its harder to bocce out a good throw in the sand than it is in the grass. Often times you can hit a ball square and it still wont move, it will just dig further into its spot. You can see that happen in the video below. Three, its tempting to throw a wild but fun shot over a net or around a post, but all the best players played it straight. Why? Because you want to have the first shot, and you want to put your first shot right on target where its hard to knock away. Four, because its relatively easy to throw your first shot on top of the pallino and relatively hard to knock those shots out, sand bocce (when played the right way) is filled with long runs. In the first championship game, I scored the first 8 points, simply by following my pallino up with an ace that Greg couldn’t quite knock out. Eventually I won the first game 11-4. In the second, and decisive, championship game, Greg scored the first 6 points the very same way. Then, when I finally got the pallino back, I scored the next 9 straight points. When Greg got the pallino back again, he scored four straight points to make it 10-9. I scored next . . . it took three consecutive shots hitting his ball to knock it out, but I finally got the point to make it 10-10, and I had the pallino. The next round was the most important in the game. Greg knocked out not one, but two of my aces to take the point and make it 11-10. His next shot was yet another ace that I was unable to knock out, so Greg got the 12-10 overtime win for the championship sometime around 12:30 at night. Andy Ingalls and Oscar Ocampo won bottles of vodka for finishing tied for 3rd, I won a gift card to Sharkey’s for finishing 2nd, and Greg got a $50 gift card to Sharkey’s for winning the tournament. It was an extremely long day, and I’m not sure that triple elimination is the way to go again, but it was tons of fun. Keep your eyes open for our next blind draw tournament. I promise that its not something you want to miss. Its tons of fun, it will let you meet your fellow league players in a way that you never have before, and it is coming soon.